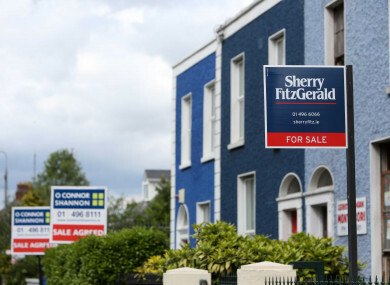 HOUSE PRICES IN Dublin are now €155,000 on average above their lowest point. That is according to the latest House Price Report released today by Daft.ie. The average price nationwide during the second quarter was €254,000, 5.6% higher than a year ago. Compared to their lowest point in 2013, prices nationwide have risen by an average of 54% or just over €89,000. In Dublin, prices rose by 1.8% between March and June, meaning that the average price in the capital is now almost €155,000 higher than five years previously. Across each of the other cities, prices rose in the last three months – by 4.8% each in Limerick and Waterford cities and by 4.7% in Cork and 4.3% in Galway. Outside the main cities, prices rose by 3.2%,with the largest increases in Connacht-Ulster and the smallest in Munster. Meanwhile the number of properties available to buy in Ireland has also gone up. In Dublin, almost 4,800 properties were available to buy in June, up close to 50% on the number a year previously. Outside the capital, there were almost 19,000 homes on the market in June – 2% below a year previously but up 2,000 on the March level. 65% of properties listed currently find a buyer within four months, in line with the figure from a year ago (66%). “Ireland’s sales market for housing remains one of strong demand and relatively weak supply. “That said, there are signs – in particular from the Dublin market – that new supply is having an effect, with increased availability on the market and a slowdown in inflation. While the increase in new homes built is welcome, it is predominantly in the form of housing estates. Lyons added that the numbers show that supply is beginning to trickle onto the market. Email “House prices in Dublin are now €155,000 higher than 2013”. Feedback on “House prices in Dublin are now €155,000 higher than 2013”.